True to the spirit of West Coast modernism, Evelyn offers a collection of sophisticated residences set at the heart of West Vancouver. 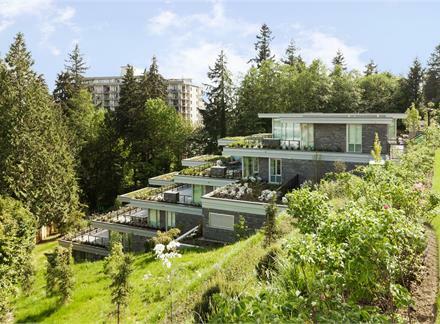 Evelyn celebrates nature in a village locale - a prestigious new address and elegant living environment, perfected by green design and the quintessential West Van lifestyle. • Built-in gas fireplace upgrade option available in some homes. To include elegant stone surround and oak mantle wrapping sides and top. • Landscaping includes heritage and additional trees, tranquil gardens and water features, inviting walkways, paths community linkages. Two convenient footpaths run through the site to Park Royal. • Ample, secured residential and visitor parking for vehicles and bicycles. • A complete selection of urban amenities, personal services and shopping adjacent to the property. Convenient access to nearby waterside parks, beaches and community services. • Oversized south facing terraces with landscaped framed edges, ranging from 100 SF – 1,600 SF. The community has been planned carefully, utilizing the most sophisticated CPTED or Crime Prevention Through Environmental Design Principles. Pedestrian pathways, vibrant open spaces offer integration for the community and provides significant “eye on the street” security.